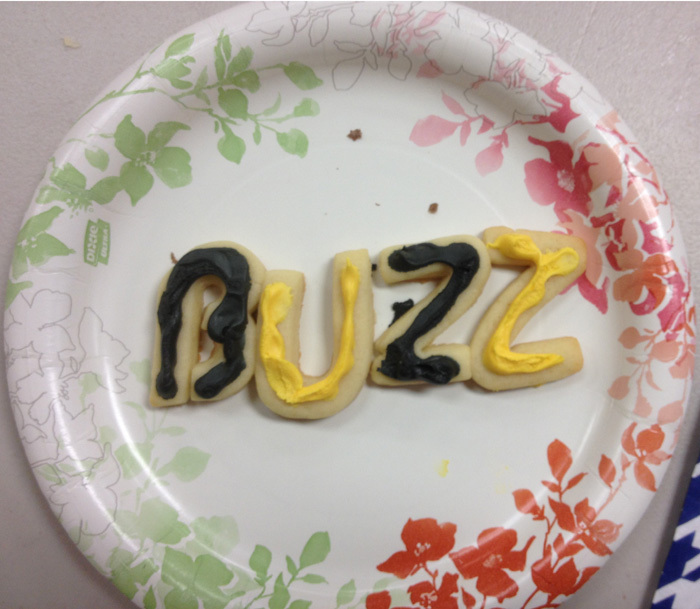 BUZZ cookies made by volunteers at the Splash dinner. Taken with my iPhone. What a treat! Last week I got to attend an event at Sacramento Splash, called Love of Learning, or LOL. These LOL events are held for Splash’s donors and, boy, have they found the right means to connect! Sacramento Splash helps children understand and value their natural world through science education and outdoor exploration. That means they take fourth graders on week-long adventures in the vernal pools behind the Splash building, at the former Mather AFB, to learn about the flowers and critters that live there. For some of these children, this is their first experience of nature and of doing real science. And the LOL events show that people who support Sacramento Splash also want to continue to learn as adults. About 50 people attended last week, to listen to Robbin Thorp, professor emeritus at UC Davis, talk about several kinds of native solitary bees that live in the uplands surrounding the vernal pools. This photo was taken during the wet year of 2011. According to Prof. Thorp, different bees collect pollen from the two flowers in bloom in the photo. 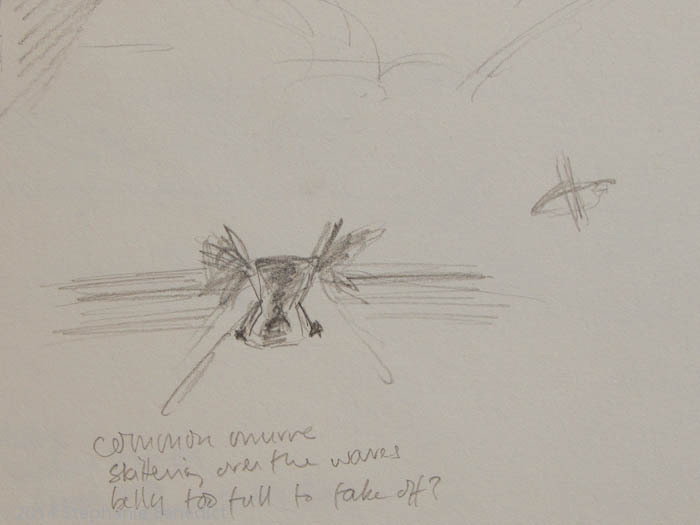 The solitary bees live most of their lives underground, in chambers built by their mothers. As larva, they feed on pollen from specific vernal pool flowers, such as goldfields or meadowfoam. They pupate into adults underground in the fall, then wait until spring to emerge as the flowers they depend on bloom. When they emerge from underground, the adult females mate, dig new underground brood chambers, gather pollen to feed their young, and lay one egg in each chamber. All bees and wasps are haplodiploid. The females can determine the gender of their eggs by selecting whether to fertilize the egg or not. Males are born from unfertilized eggs, and so contain only one set of chromosomes (the “haplo” part). Females are born from fertilized eggs, and so have two sets of chromosomes (the “diploid” part). The bees do not venture far from their local vernal pools, so the flowers are pollinated mostly from nearby flowers. 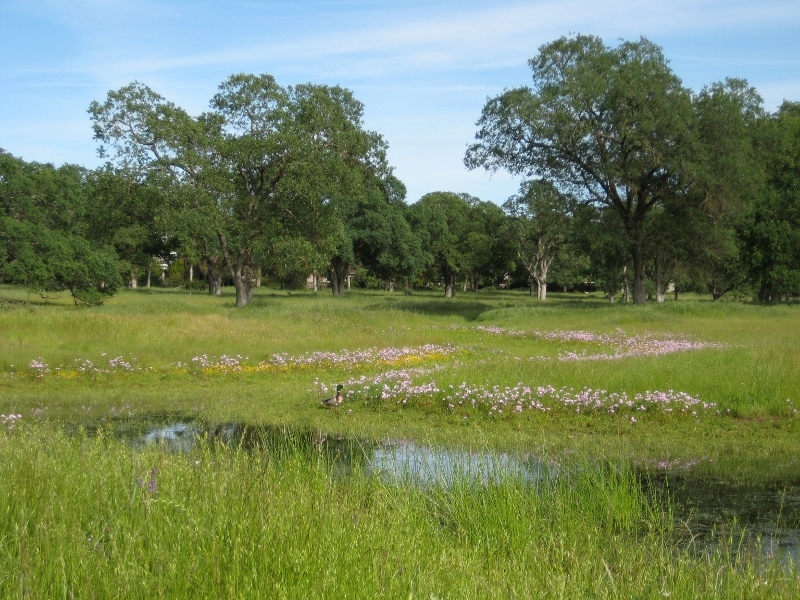 This means that efforts to mitigate the loss of vernal pools by “building” them in new locations is very unlikely to succeed, in part because the bees that pollinate the flowers will not travel far enough to find them. I discovered Sacramento Splash two years ago when they had an art show as a fundraiser. I am thrilled to be part of a community of people who care about the natural world we depend upon, and who want to pass along that world, and the love of that world, to the next generation of humans. I donate a portion of the sale price of all of my artwork to conservation and nature education organizations. I am proud to support Sacramento Splash. 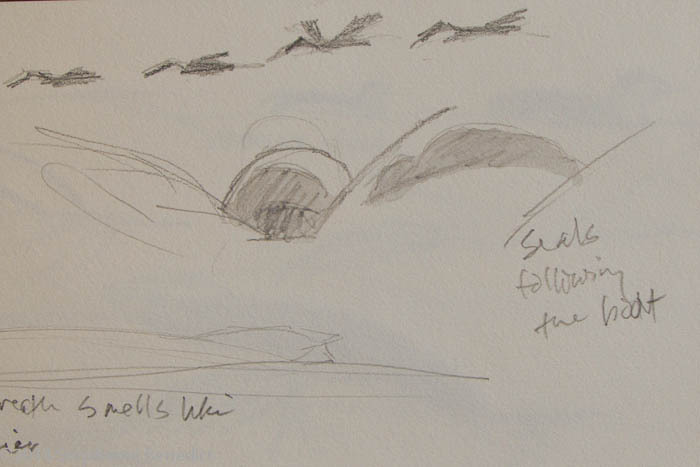 As we left the harbor, two sea lions followed in our wake, while pelicans flew along the shore. Pencil and water-soluble pencil in a Hand Book Journal sketchbook. Last October, I traveled to a different world. I went whale watching in Monterey Bay with John Muir Laws and the Nature Journal Club. It was an amazing day. Sanctuary Cruises, with their small, bio-diesel powered boat, took us out into the middle of the Bay, to what felt like a completely different planet. Humpback whales had been feeding there on anchovies all summer. The sea lions would attach schools of anchovy in a frenzy, then the whales would join in around the edges. It was a bad day to be an anchovy. At times, we could see three groups of whales spouting or breaching at the same time: one group close to us, another a little ways away, and a third near the horizon. Along with the humpbacks, we saw Risso’s dolphins, sea lions by the hundreds, common murres, and even a shearwater or two. Common murres were everywhere, no doubt also feeding on the anchovy. Several tried to flee the boat, but couldn’t get airborne–bellies too full, perhaps? Pencil in Hand Book Journal sketchbook. 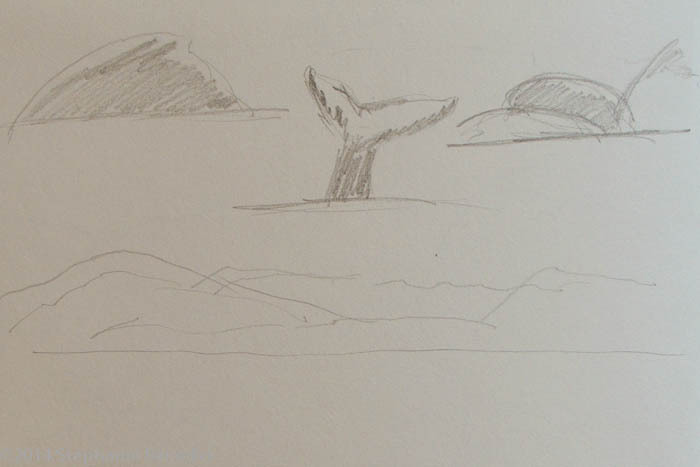 The humpbacks were everywhere that day. Pencil in a Hand Book Journal sketchbook. Because this was the Nature Journal Club, and the intent was to sketch nature, I didn’t even bring my camera. Instead, we sketched, sometimes furiously. My sketches turned out to be more like gesture drawings. What I couldn’t capture on paper were the smells—sometimes we smelled fish, sometimes whale breath (a bit like stale beer, mixed with fish). From what I’m hearing, the humpbacks continue in Monterey Bay again this year. Is it the recovery of the population since we stopped hunting them? Or is it climate change that has brought them closer to the shore? Bay Nature had an article about the humpback populations in the Bay again this year—it might be ocean currents or the periodic peak in anchovy populations. Whatever the cause, I’m grateful I had the chance to see the gathering last year. The landscape painter in me tried to capture the view of the shore from the boat. Pencil in a Hand Book Journal sketchbook. Have you been whale-watching lately? What did you see? Leave a comment, below, and let us know. Sycamore Leaves. 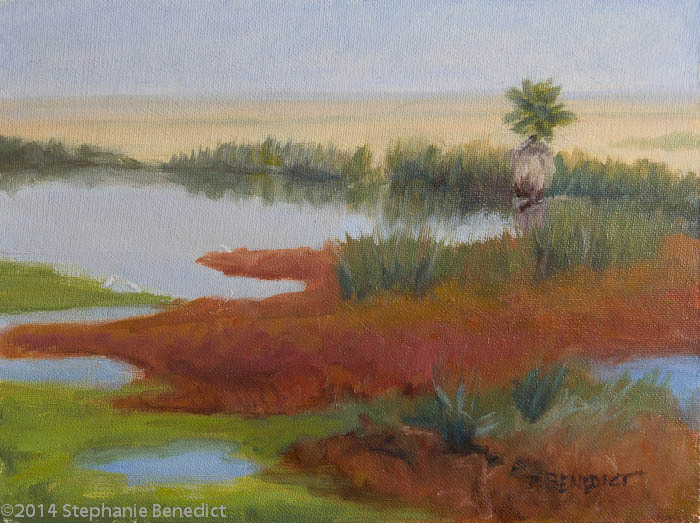 ©2014 Stephanie Benedict. 3 1/2 in x 5 1/8 in., watercolor and water soluble pencils in a Moleskine watercolor sketchbook. Autumn isn’t typically Sacramento’s best season. Most of the native trees don’t turn the brilliant colors you see in colder climates; we don’t have sugar maples or beech trees here. Oh, some of the newer subdivisions have planted Chinese pistache and liquidamber trees, which put on a nice show. But many of our trees are quieter in color. 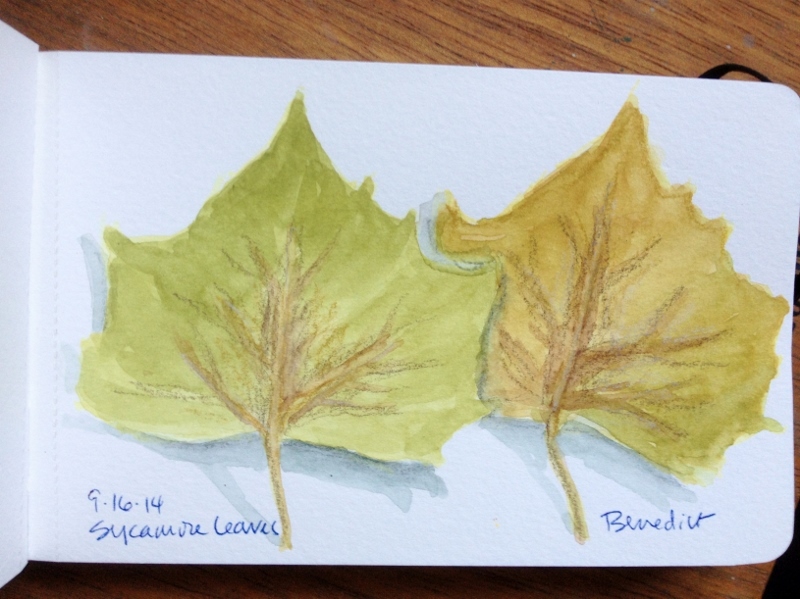 I decided to sketch some sycamore leaves, to see if I could capture the very subtle colors of the leaves as they lose their chlorophyll and turn first yellowy green. (They then just fade into a kind of gray-brown, and then fall off the tree.) It made a good exercise both to try for the subtle changes and to practice my watercolor technique. I added the pencil later, to try to get some of the texture of the leaves. In the comments below, let us know what autumn is like where you live. Pyrocumulus. 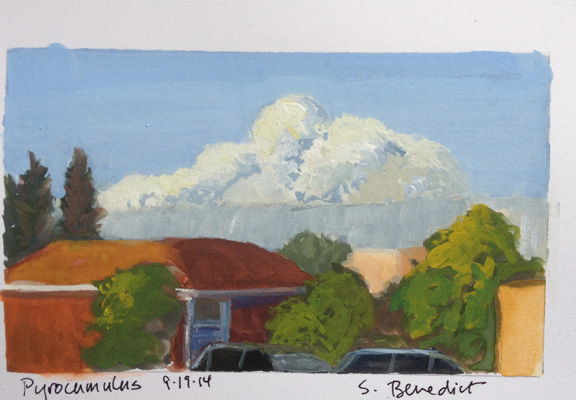 ©2014 Stephanie Benedict. 3 in x 5 in., gouache. Stillman & Birn zeta sketchbook. This is how the cloud looked to me from about 50 miles away in suburban Sacramento. Pyrocumuli contain severe turbulence, manifesting as strong gusts at the surface, which can exacerbate a large conflagration. A large pyrocumulus…may also produce lightning. A pyrocumulus which produces lightning is actually a type of cumulonimbus, a thundercloud, and is called pyrocumulonimbus. One person from Calfire said in a news report that the clouds can collapse quickly, too, sending embers out in several directions. Conditions in the Sierra Nevada foothills are so dry, after three years of drought and almost no snow last winter, that the fire just took off, increasing from about 28,000 acres to over 70,000 acres in one day. The winds shifted in the days after the pyrocumulus, slowing the fire’s expansion and sending smoke out over the Sacramento Valley and the foothills. Still, in less than a week the fire burned more than 80,000 acres (or 120 square miles) of forest, as well as a number of homes. After decades of fire suppression in California, the forests are thick with brush (where they haven’t been clear cut). It will take crews from Calfire and the US Forest Service weeks to put this fire out. The worst part? The fire was apparently deliberately set. A man has been arrested for arson. Fire is part of the natural cycle in California. People who live in the foothills know it could happen in any year, dry or no. And we could manage the forests better, leave the oldest trees, which are most fire-resistant, and either burn or cull the understory more. The forests used to burn every decade or so. But we can’t really let these fires burn now—there’s too much fuel. Just like the King Fire. Do we also have climate change? I think so, though no one can say for sure yet. National Geographic speculated on this recently. Have you been affected by fire in the West? Have you seen a pyrocumulus cloud?